This is Your Brain on Slugs! SLUGS? WHAT POSSIBLE USE would a railroad have for those slimy little creatures? Well, none of course, but locomotive slugs are almost as common in the northwest as their slimy bretherin. A slug is a non-powered locomotive that draws current for it's traction motors from another unit, commonly known as a mother. They are usually, though not always, built from retired locomotives and are used in areas where trains often run at slow speeds. Below 12 MPH most locomotives cannot use all the power generated by their prime movers and so by sending some to the slug a single engine can pull a much longer train. THERE ARE TWO GENERAL TYPES of slugs, road slugs and yard slugs. Both operate identically, the difference usually being seen in size and equipment. Many road slugs have dynamic brakes for controlling heavy trains on steep grades, whereas yard slugs usually lack this feature. Operators of road slugs in the Northwest are usually lines with poor track and steep grades which require a lot of tractive effort, but not necessarily more horsepower. A GOOD EXAMPLE of how these units are used can be found in the Central Oregon and Pacific operating between Roseburg and Eugene OR. The ruling grage through this section is 2.2% in both directions and the CORP uses 3 GP40s and two slugs to lift heavilly loaded lumber trains over it. Without the slugs they would have to use five regular locomotives to get as much tractive effort, even though they only need three units worth of horsepower. Yard slugs work on the same principal, but in a usually flat enviroment. The frequent starting and stopping of long cuts of cars while switching requires a lot of tractive and braking effort, but since yard switchers operate at low speeds, relatively little horsepower is needed. BECAUSE THEY ARE OFTEN HOME BUILT in railroad shops, most slugs tend to be quite unique by modern railroading standards. There are numerous operators of slugs throughout the northwest and they are definatly somthing worth watching for! These are the Willamete and Pacific's (W&P) two GP40-slug sets pulling out of Albany OR. This train is most likley the Toledo hauler which runs through the Coast Range to the city of the same name with mostly empty lumber cars. The line is extreemly rugged, mountainous terrain so the slugs are perfectly at home in it. These mother-slug pairs were purchased from the Norfolk Southern and arrived still in their black thouroughbred paint, quite a sight for Oregon! Both mothers and slugs are equipped with dynamic brakes, very handy for controlling heavy trains on those long steep grades. Click for larger image Two Central Oregon and Pacific (CORP) mother-slug units wind down the grade at Rice Hill OR. The mother units are GP40s, and I'm unsure of the heritage of the slugs. 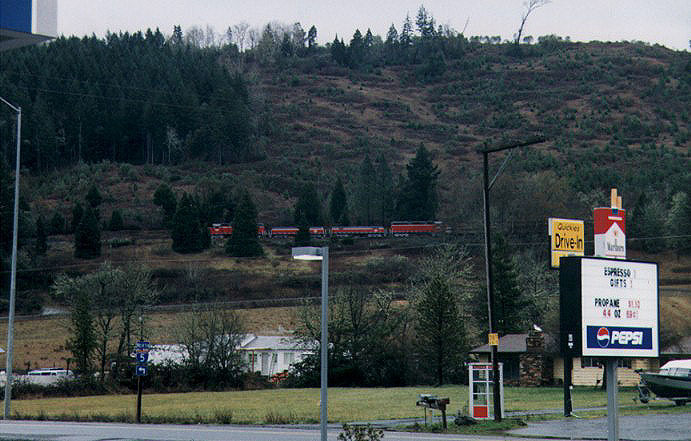 This location is visible from I-5 and is on the old Southern Pacific Siskiyou branch, part of the original main line to California.. One can see why the SP gave up this route in favor of the longer Natron Cutoff! This is a slug of an entirely different sort. This slug set is used by the BC Rail yard in North Vancouver, British Columbia. The slugs are cut down RS3 frames, and the mother unit is a Montreal Locomotive Works RS20 repowered with a Caterpillar prime mover. The BC Rail uses slugs extensively at the North Van yard and also at their yard in Squamish BC. Click for larger image Once again we see an Mother-Slug set in yard service, this one used by the Southern Pacific (now Union Pacific) for switching their large yard in Eugene OR. They were used with SW1500 mother units and helped start and stop long cuts of cars while flat switching. This is another yard slug, but a somewhat different approach. 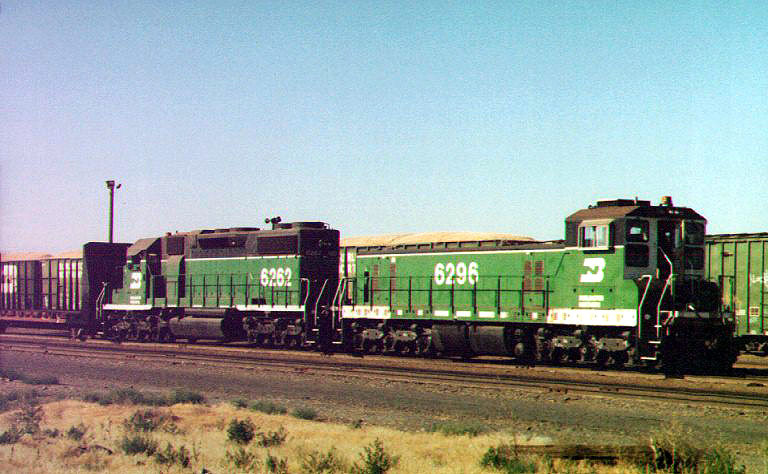 the BN 6296 is one of a half dozen or so 6 axle slugs built by the Burlington Northern from old SD9s. They are officially known as TEBC6 for Tractive Effort Booster, Cab, 6 axle and are used with SD38 mother units at Pasco and other hump yards across the BNSF system. In hump service they mother-slug set slowly pushes long cuts of cars over a small hill (the hump) where they are uncoupled and roll down the other side through a series of switches for classification. To increase crew comfort, the engineer rides in a cab on the slug, away from the pounding diesel of the mother unit. 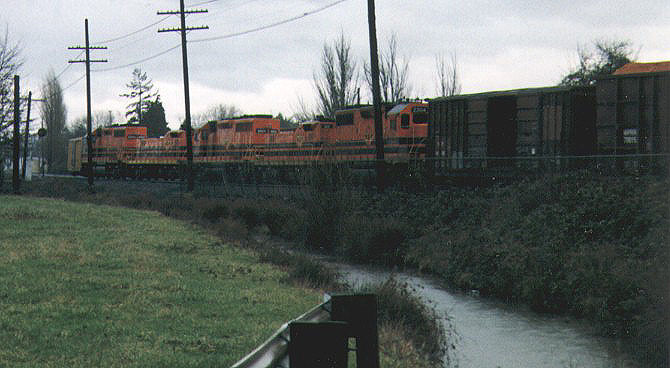 There are usually two or three SD38-TEBC6 sets at Pasco (where this picture was taken) and they rotate to Interbay Yard in Seattle for maintainence.